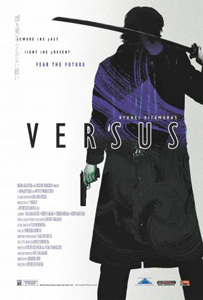 Versus is a breathtaking cross of martial arts action and horror with a liberal dose of dark comedy thrown into the mix. The film features gunplay, sword fights and gore galore with the classic battle of good versus evil as the backdrop. A group of Yakuza meet mysteriously in the Forest of Resurrection where the dead are returning to life and a struggle for the ultimate power ensues. As a piece of stylish violence this film works brilliantly and the lack of substance goes unnoticed as hugely entertaining fights occur in quick succession. If you like your action slick and your zombies bloody then watch Versus and give yourself a treat.